Lots of guests tell us that a big reason they don’t make breakfast is they don’t want to get up super early and slave away in the kitchen all morning. Trust me – I understand! 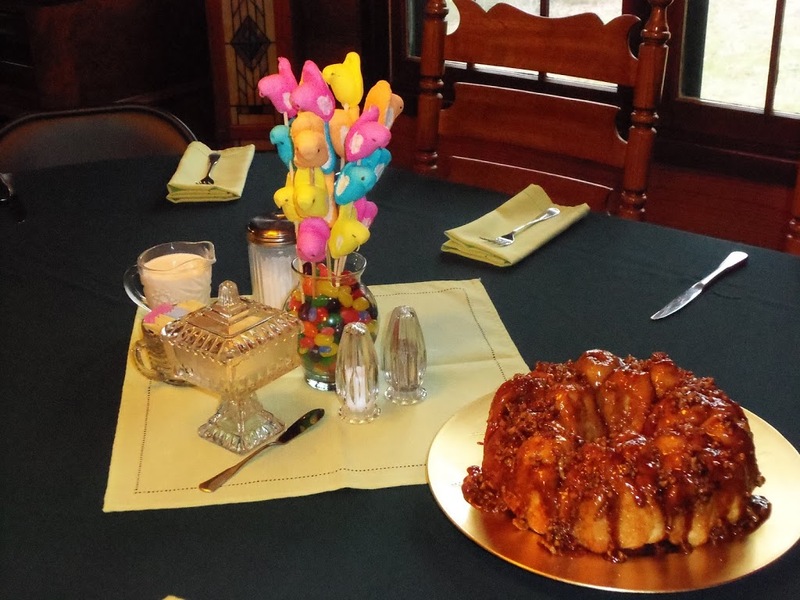 But if you’ll try our Butterscotch Monkey Bread, you can make it the night before (in about 5-10 minutes), get up in the morning, throw it in the oven, and it’s ready by the time your family sits down to the table! Grease Bundt pan. Sprinkle pecans in bottom of pan; arrange rolls around the bottom of the pan putting close together in one ring. Sprinkle pudding mix on top of rolls. In a sauce pan, melt butter, brown sugar, cinnamon until a consistency of a caramel. Pour over rolls. Cover with plastic wrap & raise overnight. Bake at 350 degrees for 20-30 minutes. Cool 5 minutes then invert.